We are going to see an answer to the question "What is SEO and the Importance of SEO in Digital Marketing" in this blog post. You might have heard of the term already, but for those who are new to Digital marketing, the term may sound them a little technical. The article will guide you on what is SEO, the importance of SEO in digital marketing, what are some benefits of SEO and how you can go about doing SEO for your site. We have heard a term SEO many a time, which is often related to search engines or web content someway. Ever wonder what it is? Well, SEO stands for Search Engine Optimization which simply means optimizing your website or blog for search engines. It involves a process of implementing techniques to increase a website's position on the Search Engine Results Pages (SERP). All of these factors put together and optimized in the best way helps a search engine decide the best position for your website in the resulted page. But obvious a question arises in one's mind why there is a need of SEO if they have everything in order on their website? The content which is nicely presented, a full detailed and quality content can still attract visitors right? Well, though your site has great content, still if it is not optimized for search engines, it loses the chance of having great exposure to the visitors who are constantly looking for the information. Importance of SEO directly comes therein. If a search engine is unable to list your website or your website has a poor appearance in the search result, ultimately your content wouldn't reach too many readers as it may have been possible. Search engines operate on a preset algorithm (a set of rules to be followed in calculations) which keeps on changing from time to time and is hard to predict. These algorithms process a vast range of data and produce a refined search result when someone makes a query in the search engine. Though some of these rules from these algorithms can be easily identified and widely accepted which are based on human actions and can help your site get listed on the higher rank. Search engine optimization techniques help you get this work done. An optimized site can produce a better rank in result listing and ultimately increases the chances of getting visitors to your site from the search result page. Hence it is important to optimize your site for better search results. Website Traffic: First and most important benefit of SEO is, it helps you gain the organic traffic (site visits generated from the search engines like Google). You could think of the tremendous amount of traffic a search engine could provide to your blog or website than any other medium available on the internet. 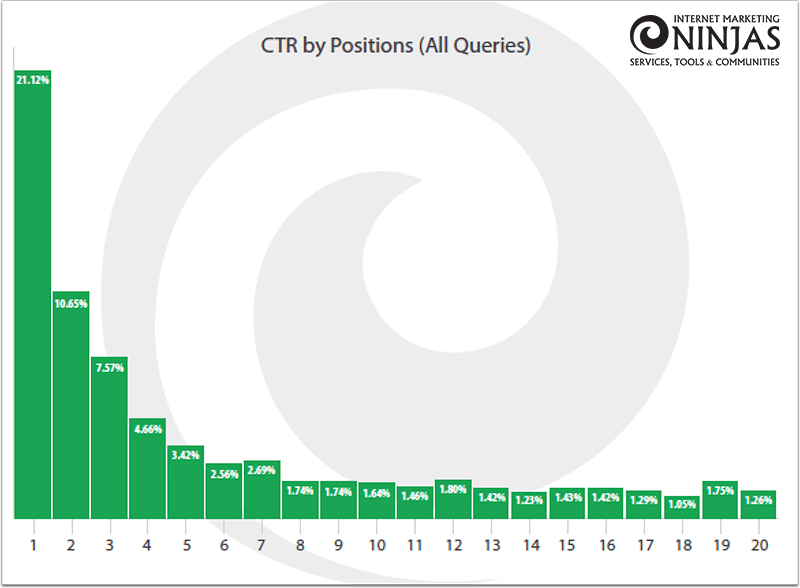 Have a look at below chart displaying CTR (Click Through Rate - a number of clicks made on a site link from the Google or any search engine result page) of the year 2017. Now if we closely look, the only first ranking website gets a maximum number of visits. As we move on to further ranks, this number goes on decreasing. For a better understanding of how important it is to rank on a higher position, let's consider an example. Let's assume that around 50,000 users from across the world make a query into the search engine "what is SEO". As per the above chart, 1st ranking site will get 10,560 visitors, the 2nd ranking website gets 5,325 visitors and site on 3rd rank will get 3785 visitors. Now see the major differences in the count of visits a particular site gets depending on its position in search ranking. Brand awareness: SEO could help you to reach more audience. People trust Google for displaying your site in top ranking and the top position in the search result page creates a good impression on the visitors. This also results in having great exposure to your website and your online presence. Ultimately it helps to make your brand known to the larger audience. Return on investment: As SEO drives more traffic to your website, you will gradually start building a fan following. People trust you for your services. This results in the greater possibility of converting a prospect to a customer which would help you make income online. Another thing is, SEO drives traffic to your site absolutely for free and hence it saves your money from wasting it on paid mediums to drive traffic. Take your website to the next level: A better-planned SEO strategy will always drive a good amount of regular and sustained traffic to your website. This traffic will open new doors for your online business to grow. You can think of upgrading your website to accommodate the requirement of the growing traffic and also plan to set your foot in a new market and economies for even greater opportunities. New customers encourage growth: The unique factor to consider is, SEO drives targeted traffic to your website and translates them into customers. You get better conversion rates, increases brand awareness, eliminates the cost involved in traffic through paid channels and increases the chances of breaking into new markets. This is all put together assists you to grow. Knowing the inner working of the search engines is really tough task and it is something that search engine companies do not wish to share with the general audience. It is fair enough not to disclose this information or else anyone with information will rank top in result listing and there wouldn't be any quality and relative content in the search results. People wouldn't trust search engine for a reliable source of information. This would encourage people to make their website search engine focused rather than focusing on content. Having said that holding the top position in SERP isn't a complete mystery. So, how one could get on top place in the SERP? There are two approaches to do SEO for your website. One is called white hat technique which involves legitimate methods one can apply to their web pages and sites to rank top in SERP. Whilst another method involves tricks to cheat search engines and get a better position in SERP. The second method is called as black hat technique and it isn't the right way to get in top position. This method violates the search engines rules and if caught you may get penalized for your actions or search engines may completely ban your content from appearing into SERP. Search engines gather information about your web page and the content inside it through computer programs called spiders and crawlers. Spider and crawlers read and analyze your web page for the content you provide. Once analyzed they assign a rank to your web page ( the process is called as indexing) based on the above-listed factors and your web page appears in the SERP. The search engine algorithm is far more complex inside, operates on secret techniques and keep on changing from time to time. Thus, it is beyond the reach of any ordinary webmaster. Though we should try our best to optimize content which is in our control. The answer to this question is "Yes, why not!". Understanding SEO technique is not too complicated. It is an easy process if done in the right way! You will have to be attentive and active to be in the competition. There will be your competitors trying many different things and to bit them you will have stay updated as per the changing demands. Google Webmaster tool helps you understand the requirement of SEO friendly site. With Google Analytics service you can review your online website traffic and make necessary changes depending on the user's behavior to meet the desired goal. There are plenty of other free and paid tools to assist with you planning keyword for your blog post, tracking backlinks of your and competitor's website, know insight details of SEO strategies and many other things. The important thing here to note is that if you are planning to do SEO by yourself, consider how much amount of time you can dedicate to it. As it certainly demands an investment of time and hence it up to you to decide if you can afford to have that much of time spent on SEO or you need to invest that time focusing on other things. Finally, to conclude, we learned that SEO means optimizing your content for search engines so they understand your content and display your web pages and site in the best deserving place. We learned how important it is to make your content search engine friendly and ensure it does appear in SERP. Having content-rich site is not enough but it also needs visitors for growth. We outlined the benefits of having SEO done for your site and these benefits are, search engines drive huge traffic to your blog, it helps to spread the brand awareness, you get better returns on the investment, you can grow your website to meet new demands and new customers coming through search engines ensures your growth. Doing SEO by yourself or not is your personal choice but most of the activities are associated with content creation and promotion strategies. i.e. when you create and promote your post. Hence from my perspective going for it has no harm. You should give it a try. Thanks for reading. Please share and comment this article if you really liked it. It's appears very nice to write about SEO thereby passing much info across. I like this. Very informational. SEO in important in every network that requires content. Including twitter feeds, facebook, instragram even reddit. Users trust search engines and having a presence in the top positions for the keywords the user is searching, increases the web site's trust. Thus, SEO is important in today's online world. Thanks for sharing this valuable post! there are many benefits in SEO and PPC. A business without Digital Marketing is imposible. Thanks for sharing this amazing blog about SEO services benefits. its the tym to improve online presence on your business and for this seo marketing company play an important role.